George Ernest and Della Agnes Smith kick back during a chilly day several years ago. Country stores in the early 1920s and ‘30s were places where folks not only bought and traded for staple supplies and housewares, but they were also places where folks came together to visit and to catch up on the news of the neighborhood. Store porches were scenes of old men sitting together swapping tall tales while they whittled, and also where a lot of trading took place. Trades were made for a variety of things such as horses, mules, guns, land, and knives, as well as dogs. This was the case in the community of Ozone, located about halfway between Independence and Taylor’s Crossroads in Overton County. A little store on the side of the road in Ozone was appropriately named “Roadside Store”. The store was originally located across the road from the place it was moved to when George Ernest Smith and his brother, Barlow Smith, went into business together in the early 1920s. Barlow Smith later sold his interest in the store to his brother, George Ernest. It was told that the store was moved from the opposite side of the road to where it stood last by hooking mules to the store building and pulling it across the road. Della Agnes Mullins was the young lady who was courted by and became the bride of George Ernest Smith. The young couple eloped when they got married, and as the years went by, their family grew to include a total of eight children, Magdalene, Charlie Lee, Clifford, Turlie, Sally, Helen, James, and Howard. George Ernest Smith went by the nickname “Crip” because measles and typhoid fever left him with a limp. But the nickname was one that was used affectionately and was never intended to make fun of his disability. The little store he ran contained all the staple goods folks used such as flour, meal, salt, beans, coffee, and canned goods. After an ice box was added, bologna and cheese were sold, too. Fresh eggs and chickens bought from neighbors were also items that were sold at the store, and tobacco products and coal oil could be bought there. During the summer months, blackberries were brought to the store by neighbors and left for a truck that came along for the purpose of buying the berries and taking them to a cannery for processing. Shelves in the Roadside Store also contained medicines for home remedies such as Cardui, Black Draught, and Carter’s Little Liver Pills. Turpentine and castor oil, along with Octagon soap and Merry War lye, were also products that were sold. The Smith family lived in a little house near the store. The house was described as having a wood stove in the middle of the room downstairs, and the upper floor was one big room with three beds. Two beds were in the downstairs room. The children were all born at home without the presence of a doctor. They all slept three to a bed, and when company came to spend a night, they would sleep across the bed to make room for everyone. Helen described Ozone as a good place to grow up in. She said their childhood was a happy one in spite of the fact that their father died from cancer when most of the younger children were quite small. The family raised their own food and cut fire wood for use in their wood stove during the winter months. The girls all helped their mother can fresh vegetables they grew in their garden every summer, and they were very proud of all their hard work when the jars were all filled at the end of each growing season. The Roadside Store is pictured long after its last days of operation. 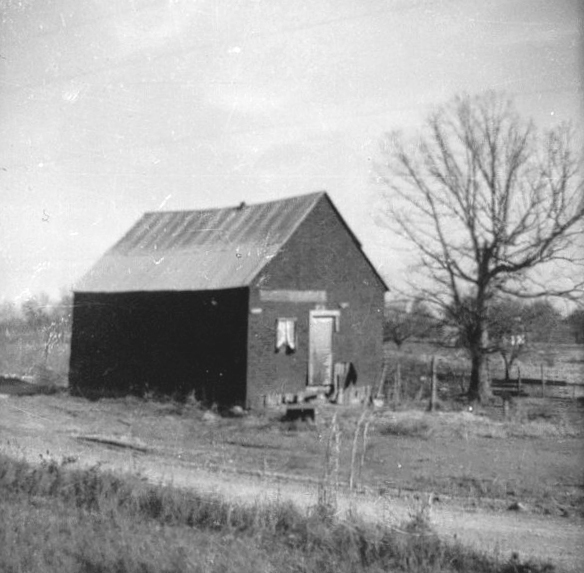 The porch on the front of the store, where many pairs of feet treaded across through the years, was already torn down when this photograph was taken. 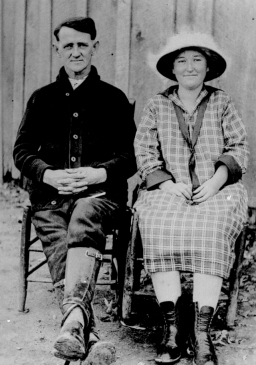 Clothes for the Smith children were often bought from Ruby Winningham (mother of Livingston Mayor Hosea Winningham), who sold used clothing in a building near her home in the Possum Trot Community, just in the edge of Pickett County. Helen remembers that Ruby had shoes for sale, too, and that she and Sally had lots of fun trying on all the high heels while they were at Ruby’s looking for clothes. Sometimes their clothes were hand-me-downs from cousins, and evidently there were lots of Smith cousins. Helen remembers a census taker coming by and taking a head count of all the families in that area. Evidently, this fellow had encountered quite a large number of folks with the last name Smith around Ozone, all of which had large families, some with as many as 10 children. After knocking on doors of Smith homes and continuing to come up with large numbers of children at each house, he finally asked the lady of one house if some plant up north was manufacturing Smith kids and sending them all to Ozone to live. The Smith children went to school at Ozone, a building that later became a general store that was last run by Paul and Mary Taylor. The Ozone school was just down the road from the Smith home, and evidently the love of reading was instilled in at least two of the Smith children. Turlie and Helen have both always loved to read and are still avid readers. The school building was the place where a frightening experience was had by everyone present one stormy, rainy day. Lightning hit a tree near the school while the children were in the classroom, and several students were injured from the lightning strike, but evidently none of the injuries were life-threatening. While Crip Smith operated the Roadside store, credit was something he extended to customers from time to time. Helen told me that on one occasion, a fellow in the neighborhood was having a hard time financially, and her father allowed the man to run up quite a large bill. In order to take care of the bill, Crip and the man worked out a deal where the debt would be paid by trading some property the man owned, with Crip paying a certain amount of cash to boot in order to settle the bill. The property contained 10 acres, and Helen told me they gave this property the name “The Jenny Ranch”. She couldn’t remember why it was given this name, but she does remember how very proud they all were to have the “Jenny Ranch”. It goes without saying that every family growing up back then, as well as now, didn’t get by without facing some hardships, but one of the things that helped get the Smith family through hard times was that they all loved music. There was always singing around the house, and many times after the store closed in the afternoon, both the Smith parents, Crip as well as Agnes, would get out their guitars and pick and sing. Friends and neighbors would also gather in after the store closed for a time of music and singing. Helen told me her mother didn’t especially like being in the spotlight, and didn’t do much picking or singing by herself, but at the end of an evening of music, someone would always request that Agnes play “Wildwood Flower”, to which she would usually reply, “Now you all don’t want to hear me play.” But she could usually be persuaded to end their music sessions with that song. Crip Smith also used his musical talent to compose a song he titled “Down by the Roadside Store”. It has been said that as many as 200 verses make up the song, and several verses are contained in a family history book written by Hollis Ramsey of Allons. The verses of the song all have to do with people of the community and incidents that occurred in the neighborhood, and many folks who are familiar with the Ozone Community would probably recognize the names contained in some of the verses. I asked Helen about her memories of Christmas when she was growing up. She told me she couldn’t remember ever getting any toys, but they always had fruit and candy. The one thing she said about not getting any toys that stood out in my mind was that she didn’t feel like she had missed out on anything by not getting toys at Christmas. She was quite happy and content with what they had. She said she never felt like they were poor people. They always had food to eat and a warm bed to sleep in, and that was always enough. As the Smith children grew up, Charlie went off to Indiana to seek his fortune. The first job he had was washing dishes in a Greek restaurant, but he later landed a job in a Catholic Hospital called St. John’s, where he eventually worked his way up to chief baker. Charlie was drafted while working in Indiana, and went off to serve his country in the Korean Conflict. He had been in the Army about a year when Clifford was drafted and also sent to Korea. When their father became ill, Charlie received a furlough to come home, and on the night before he was to leave for the United States, Clifford arrived to begin his tour of duty. The military arranged for the two brothers to spend a night together before Charlie left the next day to come home. Charlie’s wife, Joyce, told me that Charlie hated to leave Clifford in Korea, but because his father’s illness, he was needed at home. She said Charlie assumed the father role after his dad passed away, and always gave the younger kids in his family a hard time if they weren’t doing what he expected of them. Howard would sometimes hide from Charlie to avoid being questioned about playing hooky from school. But Charlie definitely had his family’s interest at heart. After he returned home from service, he built a larger home for them near to where the first home they lived in stood. The work Charlie did as chief baker while in Indiana evidently played a part when he did come home after serving in the military. He, along with Hurfert Sells, went into the restaurant business together, and ran what was known as the Black and White Café on North Church Street in Livingston. Charlie eventually bought Hurfert out and was the sole owner of the business for a while. It was while he had the Black and White Café that he met and married Joyce Ogletree during the year 1955. Joyce told me how she and Charlie once spent a night under the same roof before they had ever met, and never knew the other one was there. It seems Joyce had gone home with a girlfriend to spend the night, and as it turned out, the girlfriend was a relative of Hurfert Sells, and the home of this girls’ parents was where Charlie and Hurfert roomed. After Joyce and her friend had gone to bed, Charlie and Hurfert came in for the night from the restaurant. The young couple slept under the same roof never knowing that down life’s road the very person who each would share life with, which would include raising a son and daughter, was sleeping nearby. Charlie died at the young age of 53, as did his brother, Howard. Magdalene is also deceased. All of the Smith children have continued to love music even today. Turlie is a member of the house band that plays every Saturday night at the Independence School, and while none of the girls ever learned to play the guitar, they each like to sing. James, who is a big fan of jazz orchestra bands such as Billy Vaughn, tells the story about how in his younger days, he was always too shy to play the guitar very much in public, and that the only way he was able to overcome his shyness was to have a drink or two. On these occasions, his friends and fellow musicians all told him what a really good guitar picker he was, and after hearing this a few times, he began to believe them. But this proud feeling of being one who could be called a really good guitar player came crashing down around him when Ralph Sells brought a tape recorder to one of their music sessions and taped some of the music. It was only after Ralph played back the taped session that James says he realized that in spite of everything, he would never make the Grand Ole Opry after all, and from listening to that tape, he made up his mind that his musical career was definitely over. When comparing our lives today with those of the days when the Roadside Store was an important part of not only the Smith family, but families of that community, I wonder what kind of stories will be written about places where we shop today to buy what we consider our necessities. I would find it hard to believe that trips to Wal-Mart could ever be anything interesting or even worthwhile to read about and certainly not anywhere near as colorful or as much fun as going by the Roadside Store would have been, especially after closing time. Although the days that the store was in operation were before the time I lived in Taylor’s Crossroads, in my imagination I can almost hear the guitar music and a verse or two from the homemade lyrics of the song “Down by the Roadside” being sung by Crip Smith, as well as Agnes Smith’s version of “Wildwood Flower”. As Helen said to me, “It was a good life,” and I tend to agree.